Spring Sale is ON NOW! For a limited time, all Panama Hats in stock Take 20% Montecristi hats! Spring Special 30% off Cuenca Hats! & 30% off selected Decorative Brims! This hat has been sold! Similar a Montecristi weave and many times called a "Montecristi hat" and sold as such in the open market, but it actually isn't. It is made in Cuenca Ecuador so it is a genuine "Panama hat" but not a "Montecristi Panama hat" since it was not made in the city of Montecristi. This Cuenca version of the "Montecristi hat" goes through the normal treatments of a Cuenca hat. The weave pattern is looser and if you hold it to the sun you will see it is a more open weave, not as air tight as a Montecristi hat. To the untrained eye it does look a lot like a Montecristi hat and in many ways even the coloration can be very similar. That doesn't make it a bad hat, it just makes it a Cuenca hat. They have their upside in price! This Panama hat is the classic fedora style, known also as a center dent crown, due to the dent that runs down the center of the crown. The classic fedora is blocked on a semi long oval hat block rather then a perfectly round one to fit the average person better. Snap brim on the front causing the brim to tip downward slightly and upward in the back just a little. Almost a Stingy Brim: Just a bit smaller then our standard brim. Does offer some shade protection but more often selected for the style. Some people just look great in short brims! Each Panama hat comes with one hat band of your choice, but you may want to include a few extra hat bands- a quick way to change the personality of your Panama hat! Each and every Panama hat we sell is handmade right here in Ecuador, so no two hats are exactly alike. 1. Print our measuring tape to ensure an accurate measurement. 2. Wrap the measuring tape around the widest part of your head being sure the tape falls above your ears and the ridge of your eyebrows. 3. Using your measurements, you can view our current stock of all Panama hats for your size. Send us your question about this Cuenca Grade 4 Classic Fedora hat, and we will respond to you as soon as possible. What year was it last year? New! 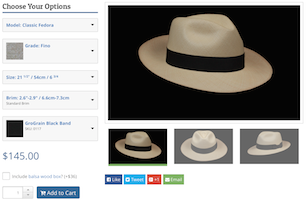 Build your own custom Panama hat! Enter to win a free hat! 5 winners are randomly selected each month.